Louisville Slugger Ultimate pitching machine. 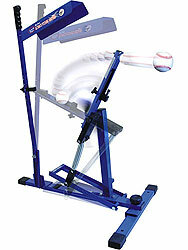 Also known as the Ultimate Pitching Machine, UPM 45, Blue Flame and the spring loaded pitching machine. Light weight makes (extremely portable) - No electricity is required - Little League-approved in hundreds of leagues including Dizzy Dean and Dixie - CONSISTENT and AFFORDABLE!!! $179.95 plus 23.45 Shipping and Handling USA. Louisville Slugger Ultimate pitching machine. Also known as the Ultimate Pitching Machine, UPM 45, Blue Flame and the spring loaded pitching machine. Light weight makes (extremely portable) - No electricity is required - Little League-approved in hundreds of leagues including Dizzy Dean and Dixie - CONSISTENT and AFFORDABLE!!! $179.95 plus $23.45 Shipping and Handling USA.